Urban Muser: liberate your art! We are preparing for the arrival of Hurricane Irene here in NYC today. But I thought why not join the blog hop over at The Kat Eye View of the World anyway. Who says you can't have a little fun while waiting for a disaster to arrive on your doorstep? Kat organized the Liberate Your Art postcard swap earlier in the summer. Participants created 5 postcards with their own original art and sent them to Kat along with postage for mailing. She then organized and swapped them and sent out 5 postcards (plus one of her own) to each participant. All told, Kat received and redistributed over 1000 postcards from 170 participants in 37 U.S. states and 13 countries! I received these 6 lovely postcards in the swap. It was fun to get some real mail in this digital age where we email and text every word. Thanks Kat for bringing this lovely art into my life. Have a great weekend everyone! If you are on the East coast in Irene's path, please stay safe. This was such a fun project. Nothing beats a little real "good" mail. We are bracing for the hurricane here in Philly. Hope you guys in NY stay safe too. It was a very fun swap and I was fortunate enough to receive your lovely tulip postcard! Lucky me :) Thanks so much! It was such a great project to be a part of. Looks like you got some really pretty ones! Stay safe this weekend! i hope everthing is ok for you guys with that weather coming.... if you need to get away from new york, california is lovely! come on over!! on another note.. I can't wait for the second round of the postcards swap it was fun! Soooo glad to have you in the swap and the hop. 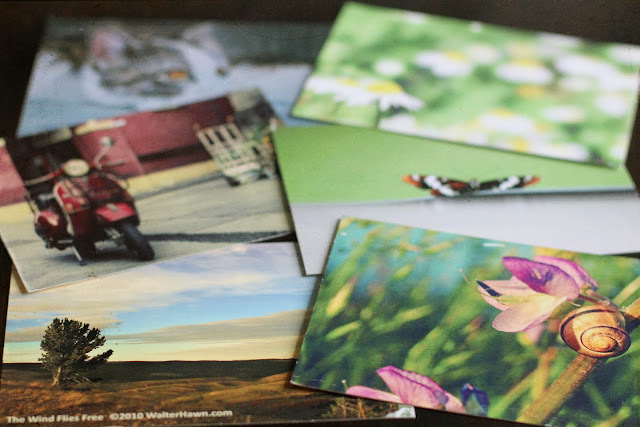 You received a beautiful group of cards! Stay safe and dry with the hurricane! I'm thinking of you. YOu really did receive a beautiful collection of cards. Be careful today - I know you are. We're just getting a few heavy gusts. Lovely! This has been great fun. I am thinking of all you "east coasters". My daughter lives is Boston, so she is keeping me updated. Take care. The swap was fun, wasn't it? Thanks for sharing pics of the cards you received. Great collection! Stay dry and safe. Thinking of you, Hubs, kitty and Willow. such a wonderful project and what beautiful collection of postcards..
What a great collections of cards. This was a nice idea! Nice to get this type of mail! Irene is starting up here ... soon to touch you as well! Hope none of the forecasts come true! That really does look like a lot of fun! I hope everything is going okay up there, U.M... stay safe! Looks like you did well in the swap. Lovely images. Great idea to get through the anxious waiting in such a creative way.. hope Irene passes by without making a big impression on NYC. Hopping the Liberate Your Art blog. Nice to meet you. Wishing Irene away from you. Stay safe at your computer! I would offer you refuge here in South East England, but I hear Irene might cycle across to us. Spent a week behind hurricane shutters on Grand Cayman once (Hurricane Mitch in 98). Spooky but lucky for us Mitch decided to skip us. This was a great project. Don't you love to get cards you can hold? Hope you are safe in the city. Hello... nice to meet you! These are such lovely postcards. Thank you for sharing. Enjoy your "artful" treasures. I am on Long Island and luckily we didn't get much damage from the hurricane! !